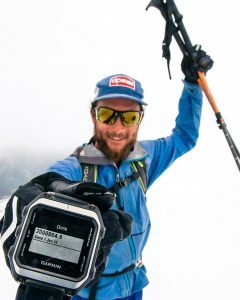 On January 1, 2016, Adventure Scholar Aaron Rice set out to achieve what no one had ever achieved; skiing 2.5 million vertical feet in a calendar year without the use of any mechanized uphill transportation. In other words, completely human powered. Aaron’s physical and emotional journey was recorded by UVM college friend and filmmaker Tyler Wilkinson-Ray’s 2017 short film, 2.5 Million. Tyler followed Aaron from the US to Canada and South America. “It was definitely never about breaking the record or setting a record, it was about pushing myself as far as I could” -Aaron Rice, October 23, 2016 the day he broke the old record of 2 million vertical feet. Aaron skied 330 days, stopping for only a few days. For awhile, he skied with a cast and one pole because of a broken bone in his hand. The film is a Vimeo Staff Pick, has been shown at major film festivals and won Powder Magazine‘s Best Documentary award. It was selected as a finalist in the film competition at the 2017 Banff Mountain Film Festival, and is touring the world as part of the Banff World Tour. Watch it now. The Flyin Ryan Hawks Foundation is proud of Aaron’s pursuit of his dream, and the Core Values that helped him keep going, stay safe, and achieve his goal. Learn more about Aaron Rice on his Adventure Scholar profile page. Read an article and interview about Tyler Wilkinson-Ray and see the film at Teton Gravity Research.